Great for Chair Sashes! Comes with 2 in a package! It's all in the details and whether you are planning a grand wedding, designing a luxurious hotel and restaurant or hosting the event of a lifetime, elegant details like our Princess Curtain & Fabric Silver Jeweled Holdbacks not only make decorating a snap but they instantly set the vibe and tone of the room from the moment your guests enter, welcoming them in fashion and style! Each ring is 3/8" thick and the outer measurement is 5 3/4" in diameter while the inner ring (where the fabric goes) measures 4 1/2" in diameter. This set of 2, shiny silver holdbacks have an ornate design with 1/8" wide rhinestones on the outer edge. 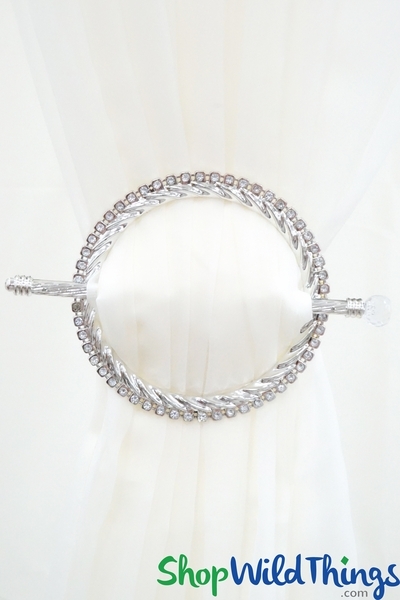 To hold the fabric, each ring comes with an 8 1/4" long stick which is also adorned with a huge faceted rhinestone on one end. Accessorize window and shower curtains, drapes, sheer panels, linens, tulle and table coverings with these fabric holdbacks that require no tools, no hardware, no installing and no damage to walls which translates to you being the smartest designer in the room! Dressy, affordable and easy to use, these holdbacks give you the freedom to quickly change the look of a curtain. Even classy String Curtains look ritzier! Simply gather the sides together, push the fabric through the center of the ring and insert the stick behind the fabric. Instant glam! 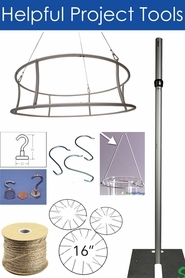 For any curtain that hangs in a doorway, you may need to open a path and these stick and ring accessories provide a needed function while adding elegance. 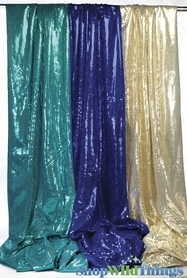 They can even be used on some of our Acrylic Beaded Curtains or Columns. These decorative curtain accents work equally well on table linens and Fabric Coverings. 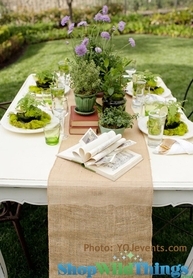 Add that finishing touch to the front of a cake table or on the ends of the head table. Easy on, easy off, portable and affordable! Priceless features for any event planners toolbox. Great look and I would recommend buying..